Morten T. Hansen wrote an essay for the Wall Street Journal called “How to Succeed in Business? Do Less.” We can all relate to his original plan for success: “work crazy hours.” We might be less familiar with his revised method, which emerged not only through keen observation of a colleague over time, but through a comprehensive five-year 5,000-person study. The conclusion was that top performers “mastered selectivity,” prioritizing their work down to the fewest possible actions to get the highest return of value. The remainder of “tasks, meetings, customers, ideas, or steps” that did not create optimal value were discarded. How else could Hansen’s coworker (Natalie) never work nights and weekends yet still be a top performer? The central idea behind this simplicity and selectivity is limiting work in progress to achieve efficiency, something we are always thinking about here at ARG. For our team to continually repeat success conducting diverse clinical trials, being “agile” is more than just a word on a brochure; it is a way of doing things. Historically, an agile approach to project and process management has been growing for decades in manufacturing and then software development, using Scrum, Kanban, and other frameworks. Since one of our core values here is innovation, it is a natural fit to be a leader of integrating agile methods into the rare CRO space. Our IT team has led the way with adoption, but many of our team members use Kanban Tool to organize, visualize, prioritize, and measure work. Each piece is important. Organization comes from breaking work into a set of manageable pieces. 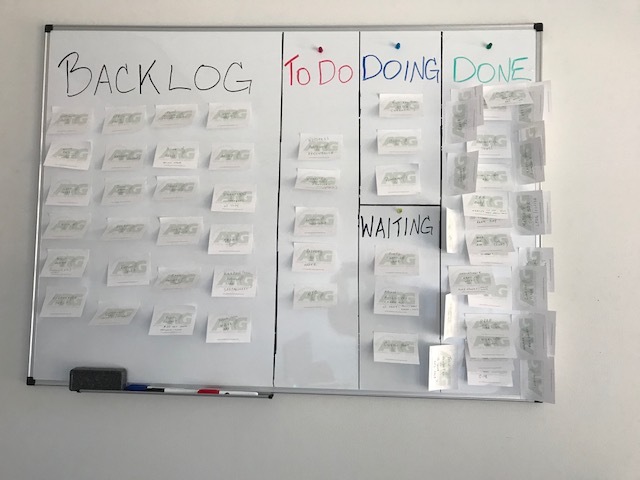 Kanban boards allow our team to see the tasks move across lanes, and to more easily spot impediments and sticking points. Because work in progress is limited, we figure out which tasks provide the optimal value to our partners. And we can measure progress every step of the way. It would be a mistake to view limiting work in progress as limiting work. Conversely, focused execution leads to greater productivity over the workday, and over time. It also leads to enhanced attention to detail, as every task is visible and prioritized in terms of time and importance. Please contact us to find out how our agile, focused approach can be applied to your clinical initiatives.